The Freemasons Foundation Centre for Men’s Health acknowledges SA Health for its ongoing commitment to the men’s health agenda here in South Australia. 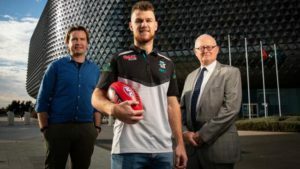 In April, Professor Paddy Phillips, Chief Medical Officer / Chief Public Health Officer at SA Health announced a new Men’s Health Ambassador, Robbie Gray, midfielder for the Port Adelaide Football Club. Robbie came on board as Men’s Health Ambassador after being diagnosed with testicular cancer in September 2017 which was picked up after he went to the team doctor following a few days of ‘feeling off’. In a series of videos available at the SA Health men’s health website, Robbie shares his advice with men to keep them at the top of their game. He talks about being active, eating healthy, not smoking and drinking responsibly, but most importantly, he tells men not to wait to see their GP. This entry was posted in News and tagged healthy lifestyle, Men's Health Ambassador, men's health week, SA Health, SNAP. Bookmark the permalink.